Matthew 5:44 – But I tell you, love your enemies and pray for those who persecute you. 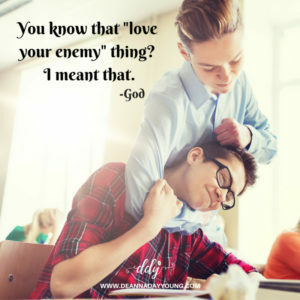 In continuing with our series on prayer, I turn to the Sermon on the Mount and see where Jesus is teaching about a lot of things – things that we don’t really like to hear like “love your enemies”. Are you serious? Love those people who are mean to me? Or who are mean to my kids? Or lead my kids astray? Surely, Lord, you aren’t telling me that I have to love those people who backstabbed me at work and made fun of my Christianity? Seriously? Yep. He’s serious. And that’s our prayer challenge today. It’s a big one for me, too. As often as you think about it today, pray for someone you don’t really care for. Is there someone who just bugs you? Someone who has wronged you? Someone you don’t care if you ever see or talk to again? Now pray for them. YES. Pray for them, for their family, their salvation, their job, their life. Pray for the Lord to bless them. It’s going to be a tough exercise but we can do it together! Ready. Set. Pray all day. This entry was posted on August 15, 2018 with tags: #prayerchallenge by Deanna Young.